Llantwit Major, being one of the most ancient villages in Wales just has to have a ghost story or two. A tailor in the town had a wife called Barbara who's dying mother-in-law entrusted to her the task of distributing her wealth equally with the rest of the family. However, Barbara's head was turned by the wealth and she decided to say nothing of the inheritance and keep it for herself. But the ghost of her husband's mother returned to exact vengeance on the woman for her dishonesty. She did this at first by constantly pinching Barbara all over her body whilst she rested in bed each night, completely depriving her of sleep. This continued until Barbara felt very ill and was covered in bruises. At this point the ghost reappeared and ordered her to either share the money equally with the family, or throw it downstream into the River Ogmore. Barbara, not wanting to reveal the theft to the family by sharing the wealth at this late date, decided to throw the money into the river, thinking that this would allow her to keep the respect of the family. However, it seems that she had more trickery in mind and did not throw it downstream as she had agreed, but upstream. I don't know why she threw it upstream, but it suggests to me that the was trying to trick the ghost and would set about retrieving it later. But the ghost was obviously not stupid and this didn't work for the hapless Barbara and threw her into a deep whirlpool in the river. She was found later by some villagers battered and bruised, but with no memory of what had happened. The ghost returned again and haunted the home that she shared with her innocent husband and children with ghostly bumps and crashes for the rest of their days. The story goes that even her children were punished. 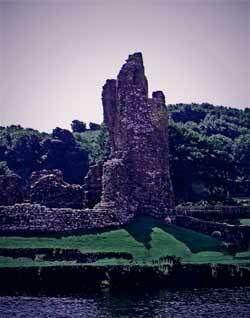 Locals were said to be "ghost ridden"
Ogmore Castle, Vale of Glamorgan.